Like all other terrorist movements, al-Qaeda will end. While it has traits that exploit and reflect the current international context, it is not utterly without precedent: some aspects of al-Qaeda are unusual, but many are not. Terrorist groups end according to recognisable patterns that have persisted for centuries, and they reflect, among other factors, the counter-terrorist policies taken against them. It makes sense to formulate those policies with a specific image of an end in mind. Understanding how terrorism ends is the best way to avoid being manipulated by the tactic. There is vast historical experience with the decline and ending of terrorist campaigns, yet few policymakers are familiar with it. This paper first explains five typical strategies of terrorism and why Western thinkers fail to grasp them. 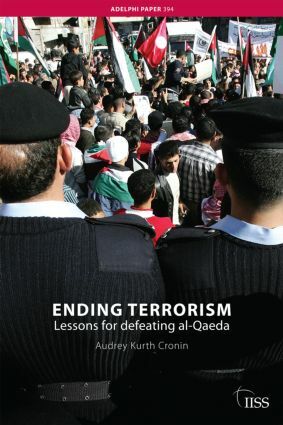 It then describes historical patterns in ending terrorism to suggest how insights from that history can lay a foundation for more effective counter-strategies. Finally, it extracts policy prescriptions specifically relevant to ending the campaign of al-Qaeda and its associates, moving towards a post-al-Qaeda world.